Riding a horse or nailing an archery target is tough at the best of times -- it's even harder when you're wearing a niqab. But that isn't about to stop a group of Indonesian women who have banded together to combat prejudice against the face-covering veil, which has been at the centre of a heated global debate over religious freedom and women's rights. 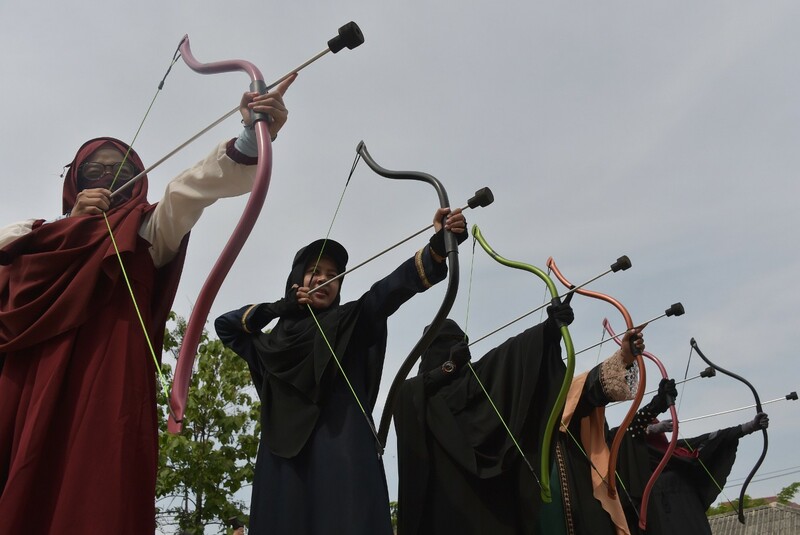 The "Niqab Squad" meets to recite the Koran or, at one recent gathering, mounted horses and tried their gloved hands at archery, activities endorsed by the Prophet Mohammed. 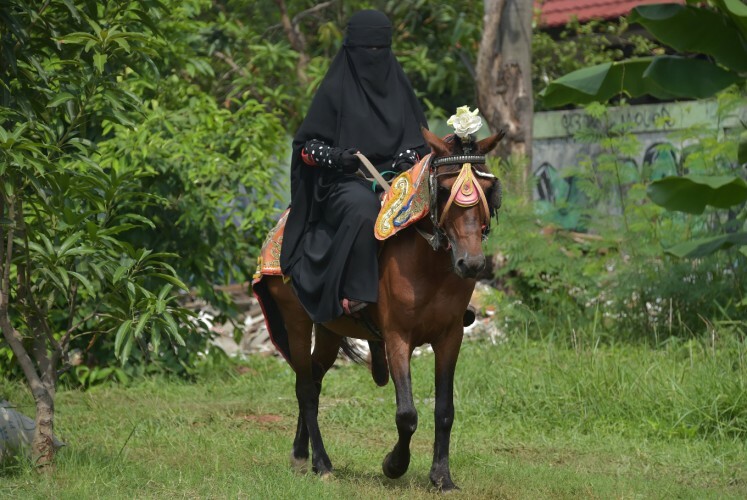 Janariah, a 19-year-old group member, had never ridden a horse before but she gave it a whirl in her flowing black veil, as other niqab-wearing novices fired off arrows with suction-cup tips. "It's not really difficult," insisted Janariah, who like many Indonesians goes by name, as she giggled and tried to keep her animal on track in the blazing Jakarta sun. "Even running is okay. If you’re used to it, it's comfortable. The most important thing is that you don't see it (niqab) as a burden and you've got to be patient." Although the body covering garment with narrow slits to see through is common in ultra-conservative Saudi Arabia and some other Gulf states, they're rare in Indonesia, where around 90 percent of its 255 million people have traditionally followed a moderate form of Islam. Recently, a private Islamic high school on the main island Java was reprimanded by local officials after pictures went viral online that showed a classroom of female students wearing niqab. The veils violated a national regulation on acceptable school uniforms. Seeking out other women facing discrimination online, Indadari Mindrayanti founded the squad this year after switching from hijab -- a headscarf that leaves the face visible -- to the more restrictive niqab in 2016. The twice-divorced Mindrayanti - who was once married to an Indonesian soap opera celebrity - saw it was a way to be more pious but the decision hasn't gone over well with her family or people on the street who often give her "weird looks". She saw it was a way to be more pious but the decision hasn't gone over well with her family or people on the street who often give her "weird looks". "It's hard to expect people to talk to you. They look kind of afraid," the 34-year-old told AFP at a mosque in Indonesia's sprawling capital. "Walking on the street sometimes I get comments like 'Wow, there's a ninja' or 'uh, very scary,' uncomfortable comments like that." Some of the group's fast-growing membership of 3,000 women in Indonesia, as well as Malaysia, Taiwan and South Africa, say they've been labelled as extremists and are regularly asked questions such as "why are you dressed like a terrorist?" Mindrayanti felt the stares when she went to France seeking treatment for a skin condition this year. France was the first European country to ban the full-face veil in public spaces and a bitter ideological battle is raging across Europe and in North America over whether the niqab, and more restrictive burqa, are key to religious freedom or an affront to women's rights. Last month, Canada's Quebec province prohibited government workers and anyone receiving public services from covering their face, which critics said unfairly targets Muslim women who wear a niqab. "Our goal is that we want to unite differences, even within Islam itself," said Mario, who was involved in organising the squad's horse riding and archery event. "There are different views even in Islam...and the prophet wants us all to unite." Still, some critics see the niqab as symbolic of a growing religious conservatism that is being exported to Indonesia via Saudi Arabia and other stricter Islamic countries. Worries about Indonesia's religious tolerance soared when Jakarta's Christian governor was jailed for two years in May on blasphemy charges. "We have to respect women who wear niqab but they cannot claim it's the best practice of the religion because it is a product of the Arabs," said Zuhairi Misrawi, head of the Muslim Moderate Society. Niqab Squad's founder, however, says she will keep trying to win over sceptics by speaking to them in a gentle, friendly voice to let people know her intentions are good, even if they're puzzled by her appearance. 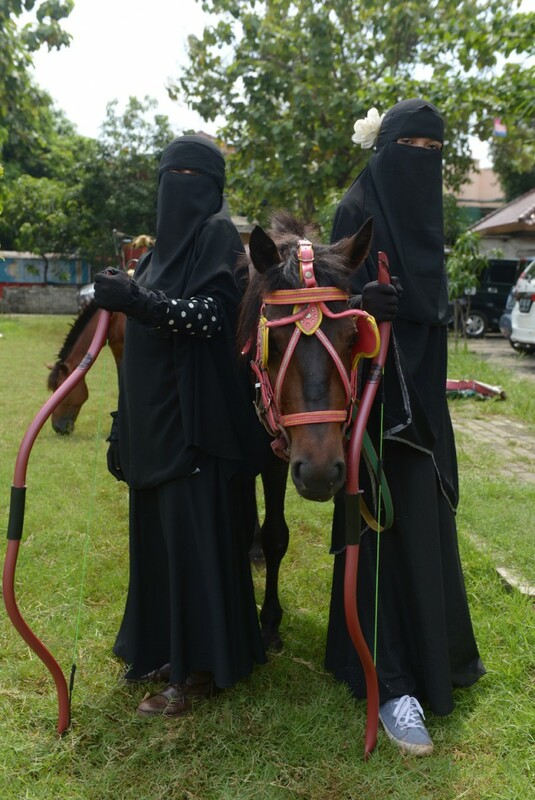 "The niqab doesn't prevent us from socialising with anyone, even if they are not Muslim," Mindrayanti added. "We can be a good ambassadors of Muslims in front of non-Muslims...(and) those who don't understand Islam and only know it from what they see in the media."